If you don’t have as many Thanksgiving leftovers as usual, maybe a large, furry predator got at ‘em. With a week left to go, November—the S&P 500’s (SPX) historically most bullish month of the year—is poised to end in the red for the first time since 2011, and only the sixth time in the past 20 years. Led by a continued sell-off in tech shares, the US stock market turned in a second-straight down week that put the SPX back into negative territory for the year and left the tech-heavy Nasdaq 100 (NDX) clinging to a 2% year-to-date gain. At its worst last week, the NDX’s correction from its early October highs reached -16%, although it pared its losses a little on Thursday. Stocks got no help from a crumbling crude oil market. While we all may be able to look forward to lower prices at the gas pump for a while, oil prices fell to their lowest level in more than a year, contributing to worries of a cooling global economy. 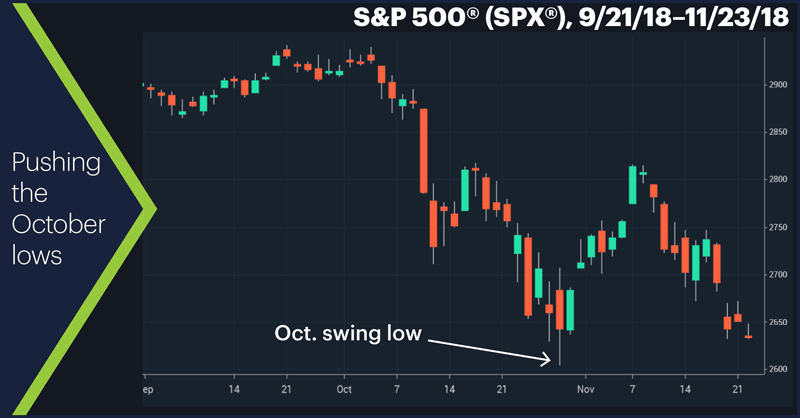 The SPX declined three of the four days of a Thanksgiving-shortened week, ending the week less than 40 points (1.5%) above its October low; the NDX broke below its October bottom on Tuesday. Sector action: The top-performing S&P 500 sectors last week were real estate (-1.4%), utilities (-1.5%), and consumer staples (-2.4)%). The worst-performing sectors were information technology (-6.1%), energy (-5.1%), and consumer discretionary (-4.3%). 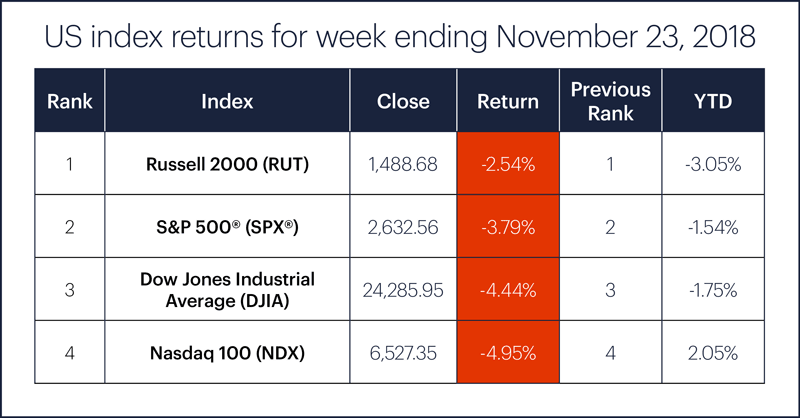 Highlight reel: Other stocks may have made bigger moves, but none mattered as much as Apple (AAPL), which fell every day last week (a total of -11%, including a 4.8% drop on Tuesday) and extended its loss from its early October high to -26%. On the upside, online retailer Overstock.com (OSTK) leapt 23% on Friday after announcing it was getting out of the online retail business and becoming a 100% crypto (blockchain) company.1 Foot Locker (FL) jumped 15% on Wednesday, while Rockwell Collins (COL) tacked on 9% on Friday. Futures watch: Crude oil built on its bear market with a couple of huge down days: January WTI crude oil futures (CLF9) fell 7% on Tuesday and another 6.5% on Friday, dropping the market as low as $50.53/barrel—its lowest level since October 2017. December Bitcoin futures (BTCZ8) are now down more than 35% since November 7 after falling another 4% on Friday to below $4,200. Taking a bite of the big Apple: Last week’s sell-off dropped AAPL below the 38.2% retracement level of its May 2016–October 2018 rally. The 50% retracement level is right around the stock’s April swing low of $160.63. 1 CNBC.com. Overstock surges 26% after CEO says it will sell retail business and go all in on crypto business by February. 11/23/18.